Want to go camping with your dog? 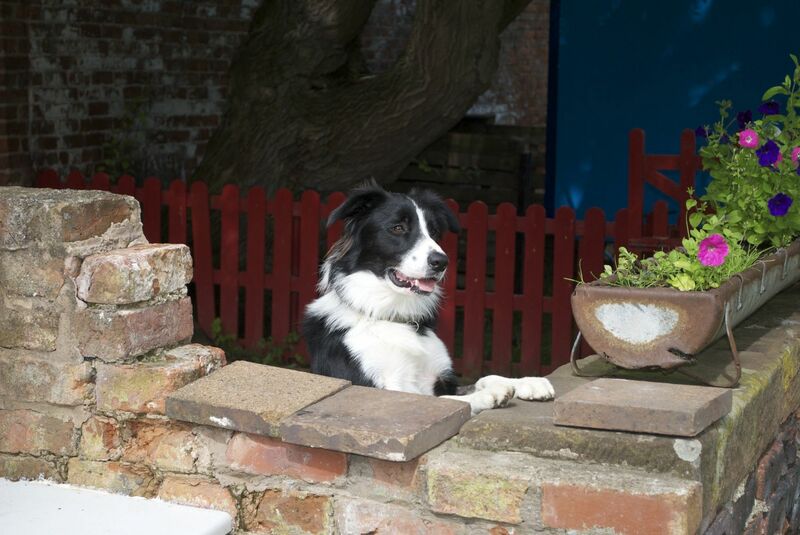 We know loads of pet-friendly campsites where your pooch is more than welcome. From dog-friendly campsites in the UK to glamping sites and campgrounds across France, Spain and Europe where dogs are permitted too. We love dogs and, just like most people, we hate to leave them at home when we go camping. But, with this list, there’s simply no need to. Find a campsite, pack some dog food and hit the road with your pooch to one of these incredible dog-friendly locations. 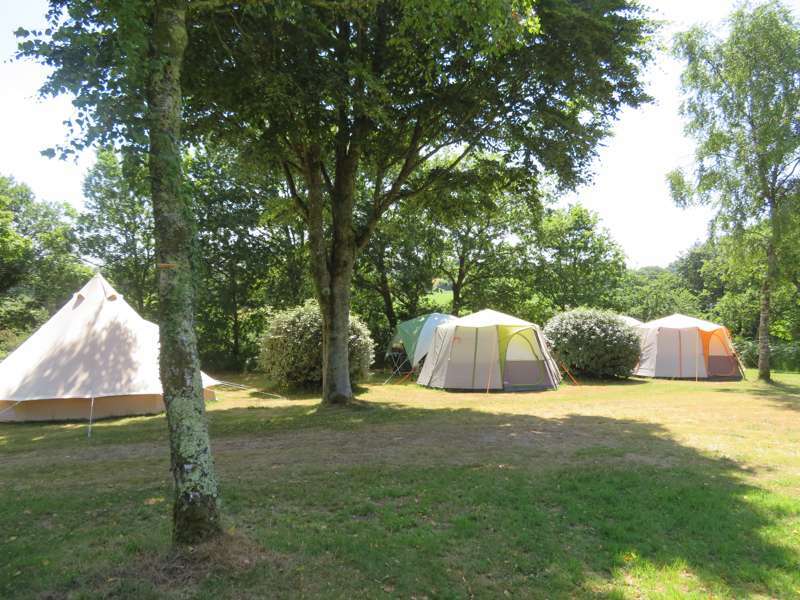 Family-friendly, lakeside camping in Brittany's Armorica Regional Natural Park. Above the tourist fray with fabric-softener views. 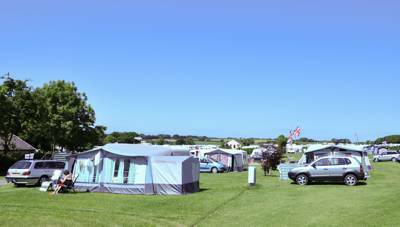 A huge family run campsite with a plethora of well kept facilities and an excellent North Devon locale. The grounds of a 17th century manor where a relaxed atmosphere and sense of pleasant privacy rules. Water sports mecca right on the shore in the Netherland's beautiful lake district. Panoramic views over the Baubigny dunes to the sea (and islands) beyond. A wonderfully rustic, uncommercial campsite surrounded by the natural delights of the Dordogne. 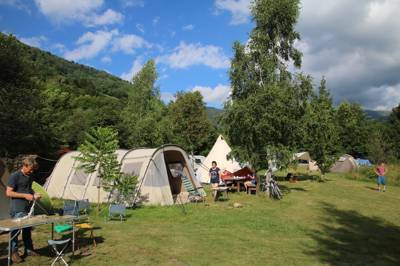 A wonderfully rustic, uncommercial campsite surrounded bythe natural delights of the Dordogne. Trickly riverside camping in the green heart of a Grand Duchy. 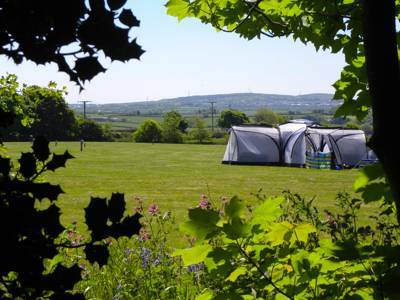 Friendly, family-orientated camping in the wonderful setting of the Dorset countryside. 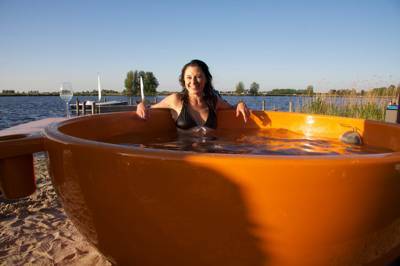 Holiday park facilities minus the mayhem. Quiet woodland camping with sea views over Mont Saint-Michel Bay. Idyllic site on the willowy banks of aquiet tributary of the Loire. This 260 acre, fully organic farm located between the ancient market town of Liskeard and Looe is positively buzzing with livestock and Cornish charm. An unbeatable location between Coniston Village and Coniston Water. A big but intimate site with 180 degree views of a cracking coastline. The only emotions are good ones at this chilled out, high altitude campsite. Chilled out yurt glamping in blissfully rural isolation. Sea views and organic farm goodies in a luscious camping meadow. Slap bang in the centre of the craziest scenery in the realm. “Off-grid living at its very best”, set amongst some of the most glorious countryside in south-west England. 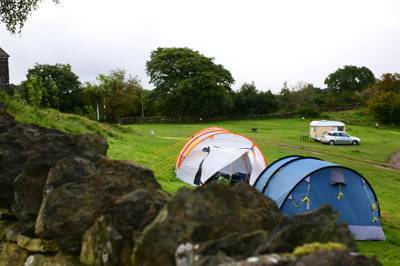 Over 400 pitches found on a gentle south-facing slope with gorgeous countryside views. A spectacular surfside setting and great-value camping. Absolute low-impact luxury, with the perfect suggestion of adventure. And guinea pigs. 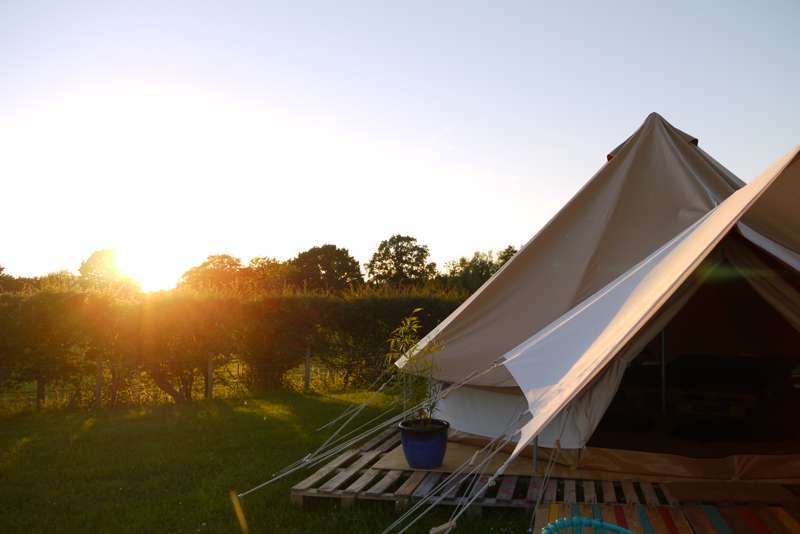 Enlivened by birdsong and the crackling sound of campfires, this is a magical Somerset glampsite that's worthy of its name. A tiny, homely campsite just a few miles fro Glastonbury Tor. A welcome in the hillside awaits at this excellently-equipped pod site in the heart of Snowdonia. Camping on the banks of the mighty River Danube, the Queen of Europe's rivers. Bordeaux wines on your right, cognac on your left and a patchwork of sunflowers, forests and rivers in between. A perfectly peaceful spot to enjoy the French countryside. Mountains, meadows, glaciers, wild flowers – everything you associate with summer in the Swiss Alps. A beautiful seafront campsite on the Normandy coast, with plenty more to offer than just its ferry-friendly location. Riverside relaxation and a location hidden among the greenery of the Presles Mountains. The front-row Dolomite view and hiking terrain make this a must for adventurers. Iceland meets the Serengeti – in Yorkshire! Attractive, friendly site on the banks of the Soca: perfect for water babies. Small scale glamping in France with the most amiable of hosts. Mountains of open space in the grounds of a fairy tale castle. A little oasis of green, and one of the finest places in Britain for wildlife spotting. Nestled amongst sleepy green hills, yet only 1.2 km from thecheerful university town of Freiburg. Be sure to bring your canoe to this Thame-side camping paradise. An orgyof outdoor pursuits at a well equipped site that lies between mountain andloch. Think of all the things you love about camping – being outdoors, breathing in the fresh air, enjoying space, sunlight and freedom. Funnily enough, when dogs go camping, they can’t get enough of that stuff either! For a dog, camping is the best kind of holiday there is. All those things to sniff, new places to explore, new neighbours to meet and acres of space to run wild. It’s paradise. But, to get it right there are always a few important things that owners should remember. Your dog needs to be healthy (vaccinated), sociable (good with other people and pets) and very obedient. And, most of all, your dog must be cleaned up after. Most campsites that allow dogs will have clear rules that you must also follow and, generally speaking, will require you to keep your dog on a lead at all times (particularly farm campsites that may have livestock). It’s also a good idea to check local dog restrictions before you leave – some areas will ban dogs on beaches during summer or in parks during certain seasons. Finally, remember to think carefully about where your dog will sleep before you leave. You may need to bring extra blankets and rugs for cleaning before they go anywhere near your tent or you may need to bring a tarpaulin to provide extra sleeping space. To a dog, camping is like the longest, bestest walk in the world. Whether it's England, Wales or Scotland, camping with your pet in the UK is often easier than you think. While some of the UK's most popular camping locations, including the likes of Cornwall, Devon and Dorset, will have restrictions on beaches during the summer months, that doesn't mean they aren't pooch-friendly patches all the same. We know of loads of campsites where dogs are welcomed with open arms and, provided you play by the rules – your dog should be on a lead, well-behaved and cleaned up after – there's no reason why your best friend shouldn't come along for the ride too. Dogs love camping and the countryside right here in the UK is the place they love to explore. Some pet-friendly campsites will have hoses for washing down your dirty dog, doggie treats in the campsite shop and even designated dog walking areas so you can let your dog off the lead on-site. Whatever you're after, find the best dog-friendly campsites in the UK below and book your next adventure online today. Travelling to France and Europe with your pet is now easier than ever before. With railway travel, ferry crossings and the channel tunnel, there are a range of ways of reaching the continent with your pet, while some airlines even allow dogs to travel too. Your pet will need an official passport, of course, and the required vaccinations, but, provided you have everything in order, travelling to France does not require long quarantine times or vast amounts of paperwork. And the best news is, that means if you're going camping in France your dog can easily come too! We love camping in France and have been across the channel with our pets and without them. And, having covered the continent over many years by campervan, car and bike, we're confident that we've found and recommend only the very best campsites. So checkout our collection of dog-friendly campsites now, safe in the knowledge that every spot has the big thumbs up from our award-winning Cool Camping team. Dog Breeds: Which Dog Breeds Are Permitted? Most campsites that we have recommended for you and your dog will welcome any of the UK's legal dog breeds. However, there are sometimes independent campsites that have more specific rules about which dogs they do and do not accept. Certain dog breeds will be welcome at every single site, while the likes of Rottweilers, Bull Dogs and other short-noses breeds will sometimes face restrictions. Where possible, we have always noted this under our Who's In heading, but if you have any doubt about whether your breed of dog will be accepted at a campsite we always recommend contacting the campsite owners directly. Similarly, in France and Europe, some campsite owners will have a preference about which dogs are and are not welcome at their location. If in doubt, just give them a call. All of the campsites we recommend have happy and helpful owners who will be willing to give you further details. Shepherd's huts, yurts, glamping pods and even treehouses (if your dog can stand the height!) It's not just campers that can take their dog on holiday these days. You can go glamping with your dog as well. 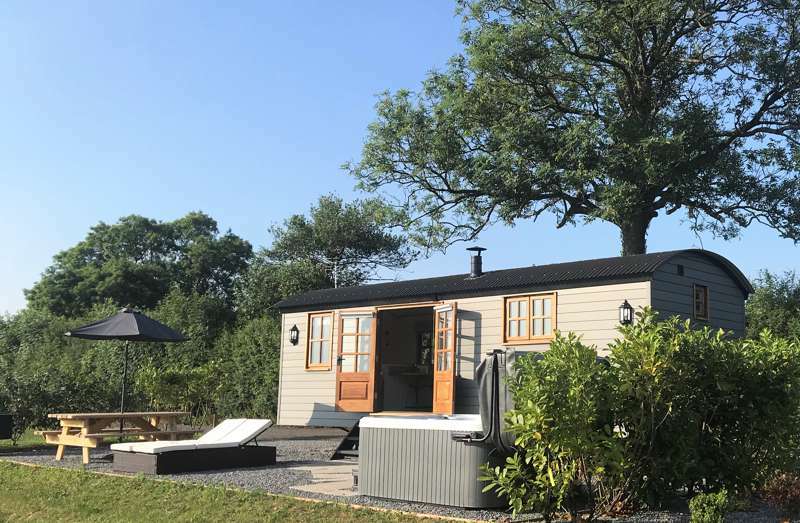 There's a fantastic range of pet-friendly glamping accommodation out their too, with more and more locations welcome your extra furry friend along. When it comes to glamping the rules of bringing your pet along can vary. Some glamping sites are completely dog friendly and will allow your pooch everywhere on-site, including inside your glamping unit. Other sites, meanwhile, will declare themselves pet-friendly but still require that your dog does not go inside the actual accommodation. In these instances you can bring your dog but he or she will have to sleep outside of your glamping unit Ina shelter that you may have to bring yourself (or in your car). The important thing is to read the information provided clearly and, if in doubt, contact the glamping site owner for further information. Dog Friendly Campsites, Dog Friendly Camping, pet friendly campsites, pet friendly camping, Dog Friendly Glampsites, Dog Friendly Glamping, pet friendly Glampsites, pet friendly Glamping, at Dog Friendly Campsites, Camping with your dog? 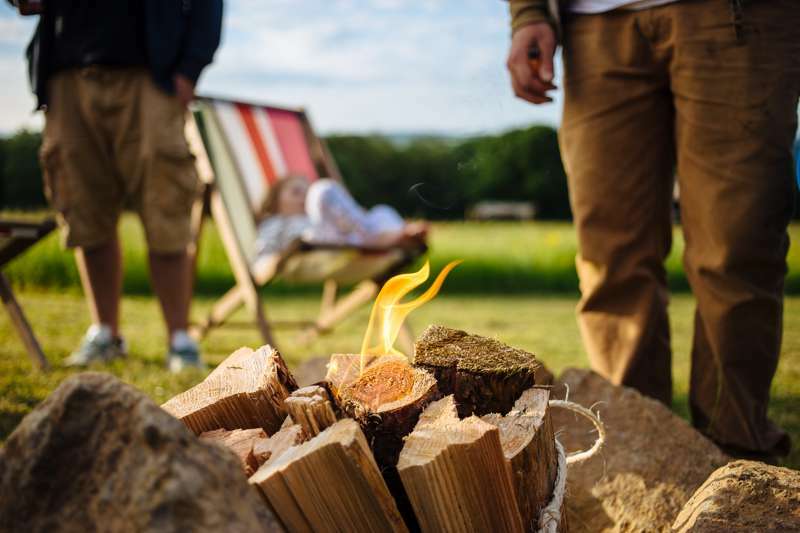 Discover the best dog-friendly campsites and glamping sites in the UK, France and Europe with Cool Camping's online collection picked especially for your pooch. From campervan-friendly sites in Languedoc and mountain campsites in Scotland, to pitching your tent in a meadow in Wales, these campsites all allow your furry friend to join you.